Many species of Rubus grow wild in large areas of Europe, Asia and North America; they vary in habit, foliage, the presence or absence of prickles, fruit size, time of ripening and flavour. The designation Rubus fruticosus is used to include the true blackberries of Europe. In North America, dewberry is the name used for the trailing Rubus species native to the eastern states; there are also erect-growing species and these and their selections are called high-bush or erect blackberries. In Australia, blackberries were introduced in the last century and are now such a nuisance that they are prohibited weeds. Gardeners have been slow to domesticate blackberries, probably because the wild fruits are so abundant, but they have been appreciated in Europe since the Iron Age. Cultivation is not mentioned in the literature until the end of the 18th century, although the use of various parts of the plant was mentioned in Gerard’s Herbal (1597). Growing on a commercial scale was begun in North America, in Massachusetts in 1833. Several American-raised cultivars were listed in the 1865 catalogue of Lawson of Edinburgh and gradually more interest was taken in growing selected forms, which produced more fruit of higher quality; some of those selected at this time were thornless, another advantage. 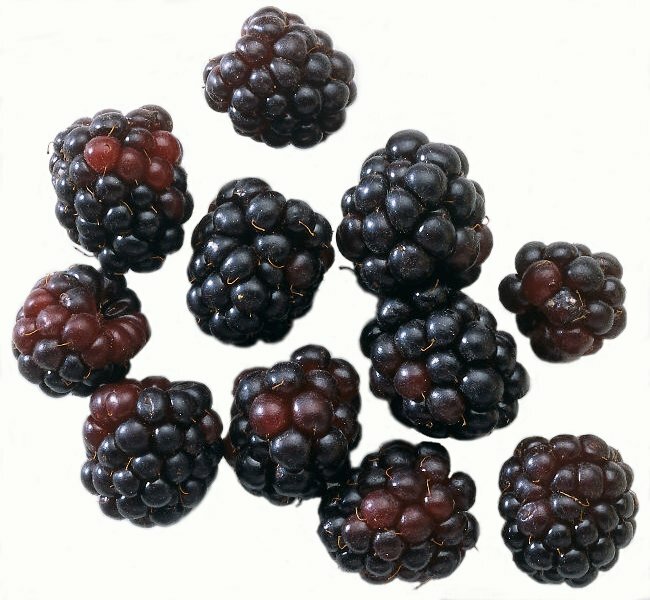 Deliberate breeding from the 20th century onwards has been aimed at thornlessness and adaptation to warmer climates; another direction has been to produce hybrid berries, which are crosses between raspberries and blackberries. The first of these to be produced was the loganberry, in the late 19th century, but more hybrids have been produced recently and are being grown in gardens and on commercial farms for customer harvesting. 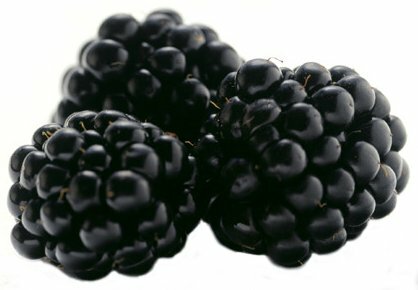 Current commercial production of blackberries and hybrid berries is of minor importance and most are grown for processing. The Japanese wineberry (Rubus phoenicolasius) is a relative of the blackberry sometimes recommended for cultivation, but the fruits are small and have little flavour though they are colourful. Blackberries and hybrid berries are chiefly grown in temperate climates but some cultivars have a relatively low requirement for winter cold and will grow satisfactorily in warmer climates such as Texas and southern Brasil. Young canes are susceptible to cold-injury in winter, but flowering is usually late enough in spring to avoid frost damage. At high altitudes the fruit season may be cut short by early autumn frosts. 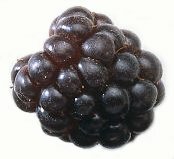 The fruiting season for blackberries is late summer until autumn frosts; hybrid berries have a shorter season. An open site, with shelter from cold winds, and a well-drained light to medium soil, give ideal conditions, but plants will tolerate a wider range of soils (pH 5.5-7.0) provided the drainage is good; in poorly drained soils plants are predisposed to cane dieback. On very fertile soils or with rich feeding, growth of blackberry canes will be very vigorous and may therefore be difficult to control. Most blackberries and hybrid berries are self-fertile and can be planted on their own. One-year-old or two-year-old plants are planted in autumn or early spring; spring planting is preferable in a continental-type climate, to avoid winter losses. There are two main types of growth, erect and trailing; both need wire supports, either against a wall or as a fence. Spacing also depends on habit; erect cultivars are planted at 2.5-3m in the row, and trailers at 3.5-4.5m. Rows are spaced at 1.8-2.1m. Before planting, clear the soil of all perennial weeds, at the same time incorporating as much organic matter as possible. The young plants are positioned so that the final soil level comes 5cm above that in the nursery. After planting the canes are cut back to a bud at 20-30cm above the soil level. For support of trailing blackberries and hybrid berries, three or four wires are stretched at 30-45cm apart, the lowest at 1m from the ground and the top wire at 2m. To hold the wires, posts 2.3-2.5m long can be driven 0.5-0.6m into the ground at 3.5-4.5m apart, or vine eyes can be fixed to a brick wall or solid wooden fence and the wires threaded through. For erect blackberries one wire 1m above the ground will be sufficient. The new canes are tied on to the wires during the growing season. In the second and subsequent seasons, the new canes are tied in away from the fruiting canes to prevent damage to them during picking, to make winter pruning and tying easier, and to prevent spread of disease from old to new canes. The canes fruit in their second year. After fruiting, they are cut out at ground level to make way for the new canes. In cold climates, the old canes may be left in position to give some extra protection to the new canes over winter; alternatively the new canes may be bunched together on the wire or laid on the ground and covered with a layer of straw for the winter. In spring they are retied to the supporting wires. Manuring is aimed at producing good but not excessive growth of new canes each year; liberal annual applications of farmyard manure or other type of organic material will supply nitrogen, but sulphate of ammonia at 60g/m² may be substituted. Potash is needed to maintain fruit yield, and sulphate of potash at 15g/m² should be applied in late winter. Phosphate is not needed annually; every third year give 60g/m² superphosphate. Annual mulching with organic material will help to keep down weeds; shallow hoeing or herbicide application are other methods of weed control. Water in dry periods, applying an inch at a time at ground level. The critical period for watering is when the first fruits start to turn colour. 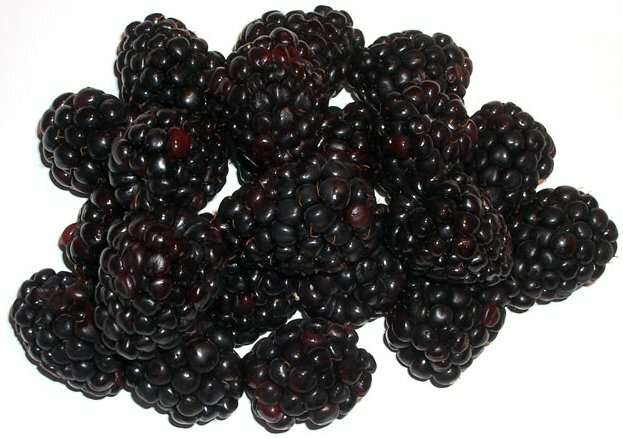 Fruits are picked when glossy black (blackberries) or dark red (hybrid berries) and dry, with a plug. Blackberry fruits have the highest content of vitamin A among berry fruits. The erect blackberries are suited to machine harvesting, practised in the US. Propagating by tip-layering is easy for most blackberry cultivars and is used on a small scale. In late summer shoots are bent down to soil level, and the tips buried 15cm deep. In the following spring, rooted plants are cut off from the mother plant with about 30cm of cane. For large-scale propagation leaf bud cuttings are taken from late summer to early autumn, inserted in a firm, sandy mixture under polythene cover or mist. Rooting takes 6-8 weeks, and the cuttings are lined out in nursery rows, or if taken late are potted and kept under cover before before lining out in spring. Erect blackberries are propagated by root cuttings 7.5cm long or by suckers. Plants used for propagation must be healthy. Principal pests include the blackberry aphid (Sitobion fragariae); two tortricid moths, the eye-spotted bud moth (Spilonota ocellana) also present in North America, with larvae that bore into the buds, and the bramble foot moth (Notocelia uddmanniana) with larvae that feed on the flowers and web the shoots together; capsid bugs; and the bramble leaf hopper (Ribautiana tenerrima) with pale yellow green adults, up to 3mm long causing leaf mottling. The raspberry beetle (Byturus tomentosus) is widespread in Europe, where it is responsible for maggoty blackberries; a related species, the raspberry fruitworm (Byturus unicolor), causes similar damage in North America. Irregular ripening of blackberries, where some of the drupelets remain red, is caused by a gall mite, the blackberry mite (Acalitus essigi) known in the US as the red berry mite. Virus diseases cause reduced yields and stunted growth; destroy infected plants. Recommended cultivars. ‘Ashton Cross’: mid-season, vigorous, thorny. ‘Bedford Giant’: early, heavy cropping, vigorous, thorny canes. ‘Black Satin’: mid-season to late-season, thornless, vigorous. ‘Dirksen’: thornless, very hardy. ‘Evergreen Thornless’: mid-season to late-season, heavy crops of good quality fruits. ‘Fantasia’: very vigorous, extra-large fruit. ‘Himalaya Giant’ (‘Theodor Reimers’): early to mid-season, very vigorous, thorny, heavy crops. ‘Hull’: very prolific. ‘Loch Ness’: mid-season, semi-erect, spineless canes. ‘Marion’: early to mid-season, very vigorous, thorny, good fruit flavour. ‘Smoothstem’: thornless. ‘Thornfree’: late, of moderate vigour.